Sometimes the art market is an unpleasant place resulting from art forgeries that not only disadvantage the original artists financially, but also undermine the integrity and the quality of their artistic practice. 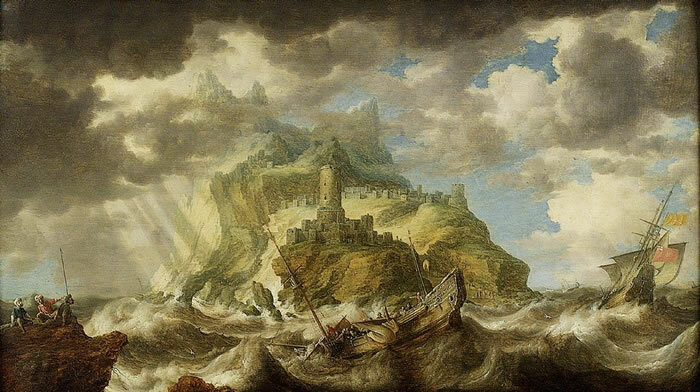 Certainly this was a problem for Claude Lorrain (1600–82) who suffered from widespread forgery of his paintings. To circumvent this crime, Lorrain created a compendium of drawings reproducing his paintings as a record for authentication purposes. This bound book of 195 drawings (now in the British Museum) was titled, Liber Veritatis (“Book of Truth”), by John Boydell when he published them as a suite of mezzotint prints transcribed from the drawings by Richard Earlom (1743–1822). 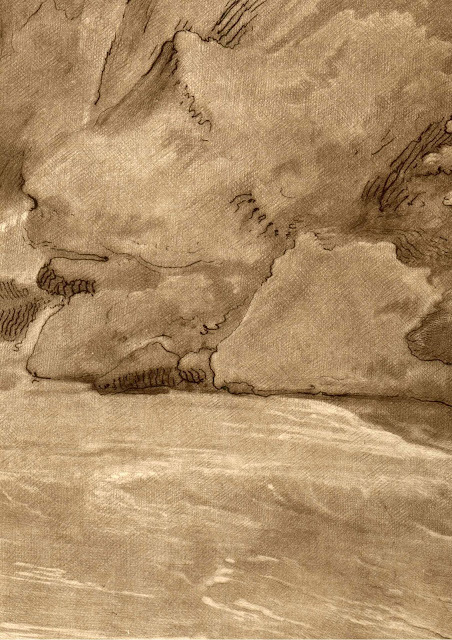 Beyond creating an inventory of his paintings from 1635 (when he commenced work on the compendium) until he died, this archive also showcases the gradual evolution of Lorrain's manner of drawing. In the earlier post, Stylistic Consistency, for instance, I borrowed a phrase from a friend of mine who described the line work in Lorrain’s earlier etchings as looking like “shaggy goat hair,” as exemplified by The Herdsman and the Shepherdess, c.1630 (shown below). 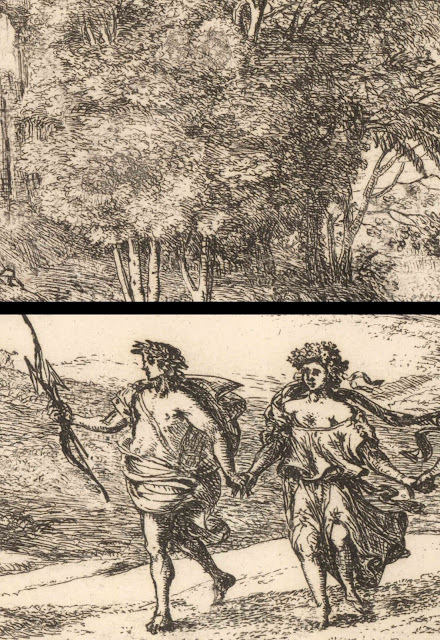 This early use of line gradually evolves to his later sensitivity in shaping each stroke to fit the context in which it is applied, as exemplified by Time, Apollo and the Seasons, 1662 (shown further below). 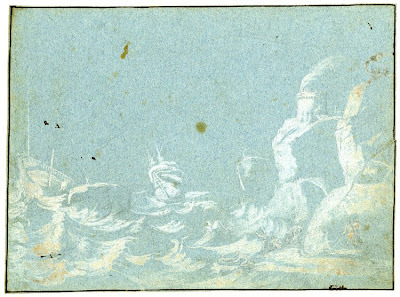 Condition: very rich, well-inked impression, trimmed within the plate edge with traces of mounting at the corners (verso), otherwise in excellent condition. I am selling this print for $210 AUD including postage and handling to anywhere in the world. Please contact me using the email link at the top of the page if you are interested or click the “Buy Now” button below. Inscribed below lower margin in two lines: “Apollo in atto di obedire al tempo. La Primavera a cominciare il ballo. Lestate non manca del suo calore. L’autunno colsuo licore / Seguita. Linverno tiene la sua staggione”; and, “Claudio Gillee inven. Fec. in Roma 1662 conlicenza de super.” (lower right). I am selling this print for $310 AUD including postage and handling to anywhere in the world. Please contact me using the email link at the top of the page if you are interested or click the “Buy Now” button below. In the following discussion, spreading over three instalments, I will build upon the argument presented in the earlier post about Lorrain’s drawing style and address how he and artists following in his footsteps (in terms of creating paper museums about their art practice) used very different approaches for reproducing paintings and drawings. Let me return back to Lorrain, as his approach to etching was undoubtedly in Richard Earlom’s mind when Earlom interpreted Lorrain’s drawings for reproduction in the Liber Veritatis. 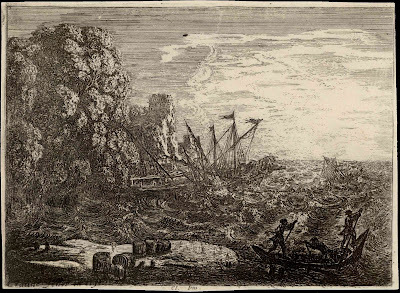 In terms of the hallmarks of Lorrain’s approach to drawing and etching, these are showcased in the moody print, The Tempest with a Shipwreck, c.1638–41 (shown below). Here, the first critical attribute of Lorrain’s approach may be seen in the way he translates a scene of ocean turmoil, with foundering ships and struggling men, by reducing what is portrayed down to its essentials. 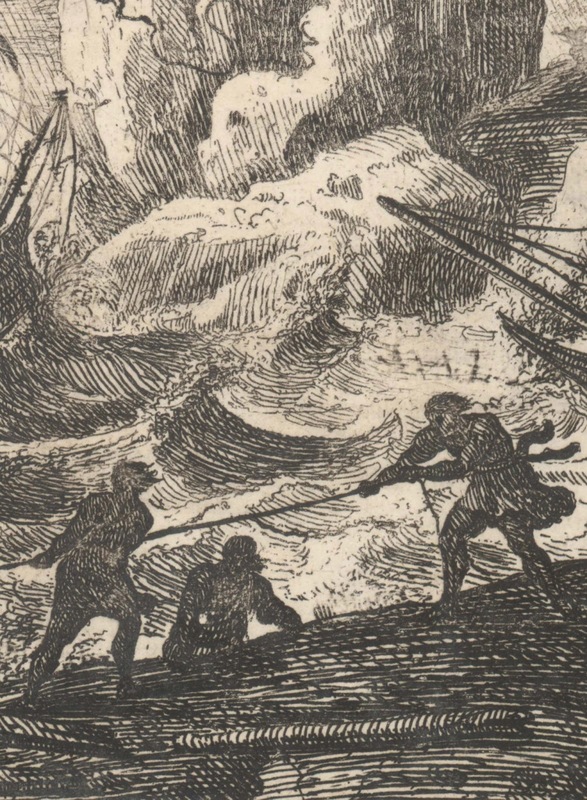 In this print, the outcome of such a reductive process is a virtual silhouette view of three figures in the foreground with ocean battered ships further away that are semi-flattened to a shallow space along with the choppy waves supporting them. The second important attribute in his approach is the contrast that he employs through juxtaposing a graphic treatment of key elements in a scene (i.e. the important features are portrayed in a stylised way) with mimetic treatment of the more generic elements in the scene (i.e. the non-essential components of the scene are portrayed realistically). 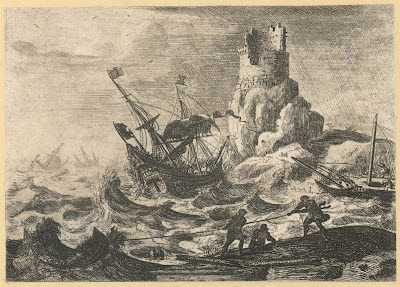 In Lorrain’s representation of a storm in this print, for instance, the contrast is between the graphic treatment of men, ships and stormy sea juxtaposed with the mimetic treatment of a tower fortification in the near distance (see details further below). Condition: well-inked impression in excellent condition with no foxing or blemishes. The print has been trimmed within the plate edge and attached at the corners to the same support sheet as issued by McCreery in 1816. 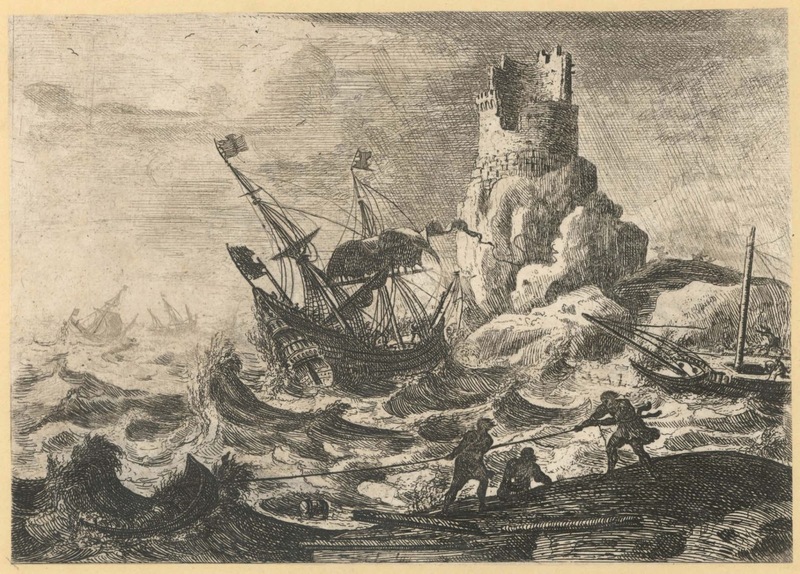 As a point of comparison between Lorrain’s approach to etching and his manner of drawing, see Lorrain’s two drawings from the Liber Veritatis (shown below) that relate to his etching, The Tempest with a Shipwreck. What I find rewarding to contemplate is the evolution of the imagery, in terms of simplification, from the earlier of these drawings (dated 1628–39) to the later one (dated 1643). What is also interesting is that both drawings were executed after the print rather than being used as preliminary studies for it—this supposition is based on the fact that the earlier drawing and print are not mirror images of each other. 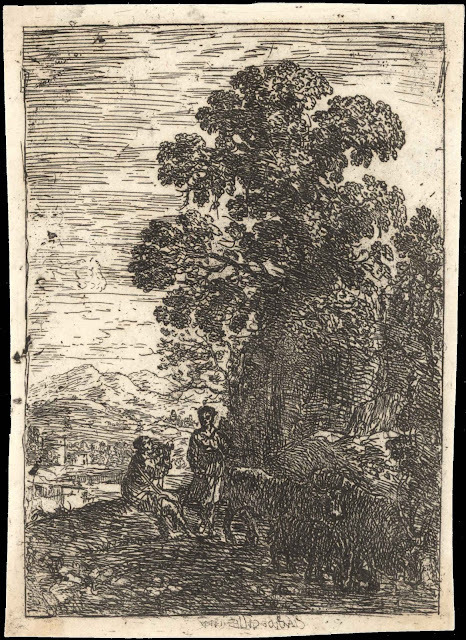 These hallmarks of Lorrain’s approach to etching—his reductive selection of subject matter to its essentials and his contrast of graphic and mimetic treatments—lies at the heart of what makes his prints so distinctly his own. 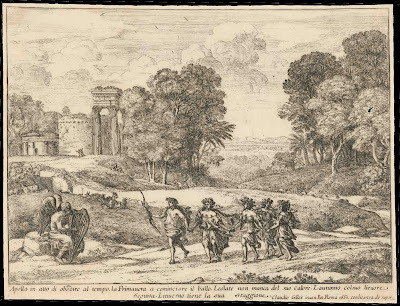 To illustrate this point further, note how in the etching, Time, Apollo and the Seasons, Lorrain has simplified the portrayed landscape so that each rise and fall in the terrain is spatially flattened like scenery on stage-flats in a theatrical production. 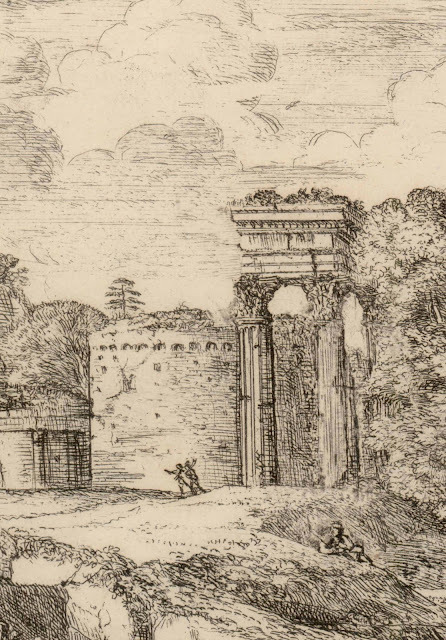 Note also how the stylised—almost schematic—treatment of the foreground figures contrasts with the pictorially realistic treatment of the architectural features and trees in the distance (see detail further below). 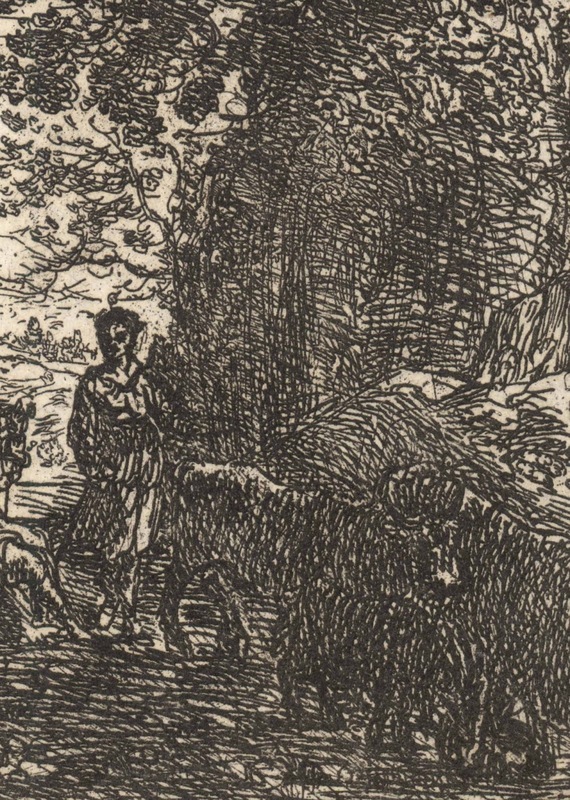 When a contemporary audience examines Lorrain’s approach to etching, there is a high probability that his way of creating images will not seem particularly novel. After all, most contemporary viewers are accustomed to seeing artworks that are pictorially and conceptually much more adventurous than Lorrain’s prints. In fact, his approach may even seem like a very natural way to draw and to compose images. Nevertheless, when contextualised with artists working in Lorrain’s time period the distinctiveness of his practice becomes apparent. 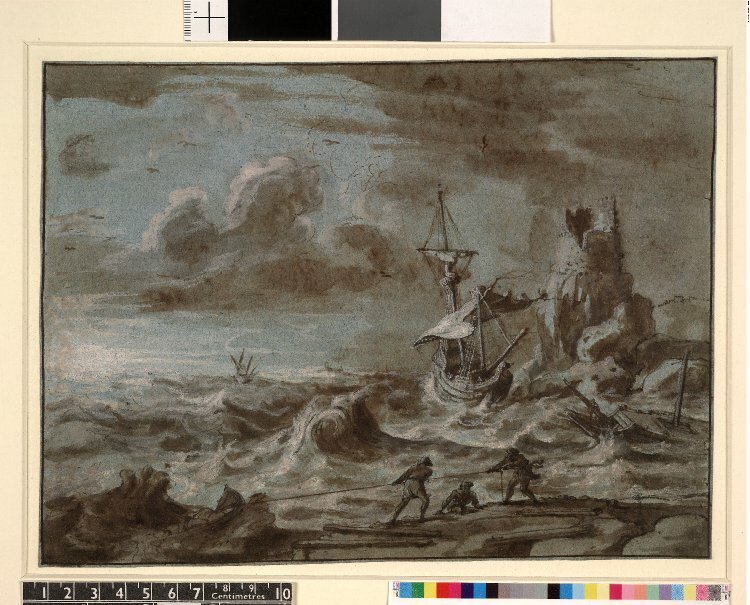 Compare, for example, Lorrain’s The Tempest with a Shipwreck with Bonaventura Peeters’ [1614-52] depiction of a very similar storm scene in A Dismasted Ship in a Rough Sea (shown below). With regard to Richard Earlom’s reproduction of Lorrain’s drawings, there is a conceptual gulf separating Lorrain and Earlom’s practices. Lorrain’s approach to reproducing his own paintings and drawings for the Liber Veritatis is well summed up by Sabine Conté’s (1971) term for it as being “a posteriori” (see Claude Lorrain: The Great Draughtsman, p. 66) in the sense that Lorrain’s approach is more about recording of his former ideas and designs than with creating fresh artworks. 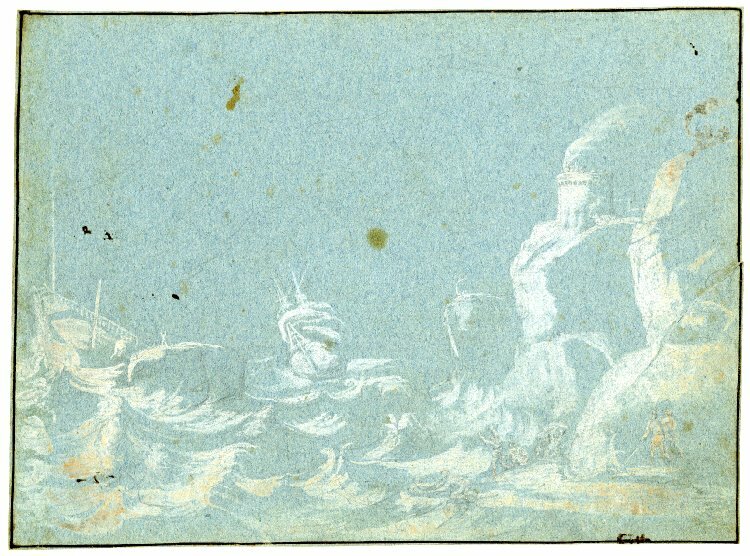 By contrast, I wish to propose that Earlom’s approach is more about reshaping Lorrain’s compositions to match Earlom’s own artistic disposition and sensitivities than creating authentic facsimiles of Lorrain’s drawings. 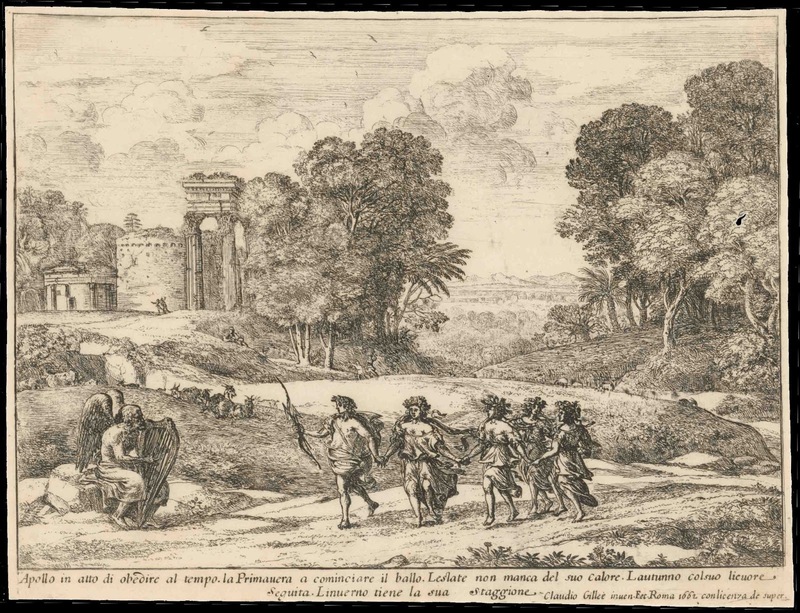 Arguably this difference in approach rests to a large extent with the medium Earlom chose to transcribe Lorrain’s drawings into print: mezzotint. 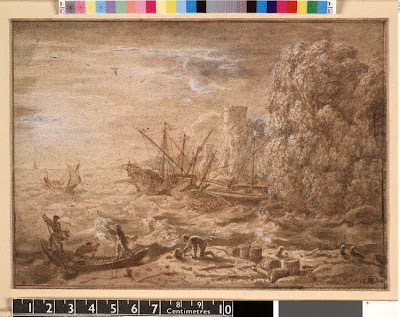 No doubt from Earlom’s standpoint this remarkable medium gave him the facility to render gradations of tone with great subtlety as if he were laying watercolour washes (see a brief explanation of the mezzotint process in the earlier post, 18th century Photoshop). 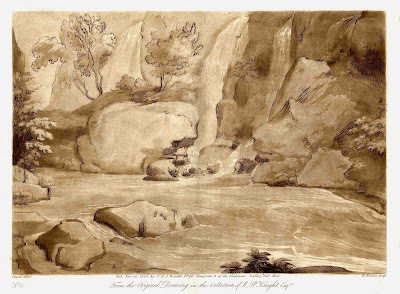 Despite the degree of nuance that Earlom was able to command, his use of the mezzotint process to replicate Lorrain’s drawings falls short in matching the sparkling effect of looking into light that is the essence of Lorrain’s vision: the contre-jour effect (i.e. placing his subjects in front of the light source). Whereas Earlom reproduces Lorrain’s compositional arrangements of placing key features against the light, the mezzotint medium is not ideal for duplicating the glimmer of white paper shinning through the overlay of Lorrain’s pen lines. To illustrate this difference compare the degree of luminosity captured in Earlom’s No. 5. 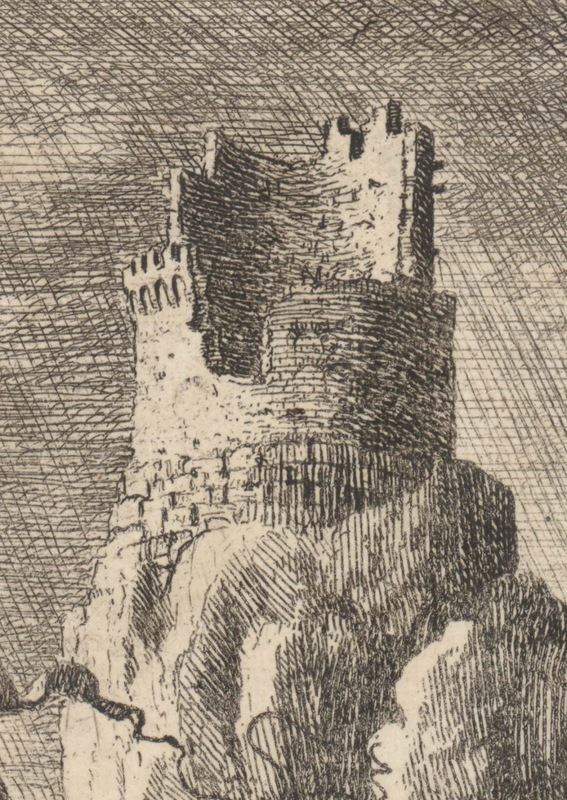 From the Original Drawing in the Collection of R.P. Knight Esq. 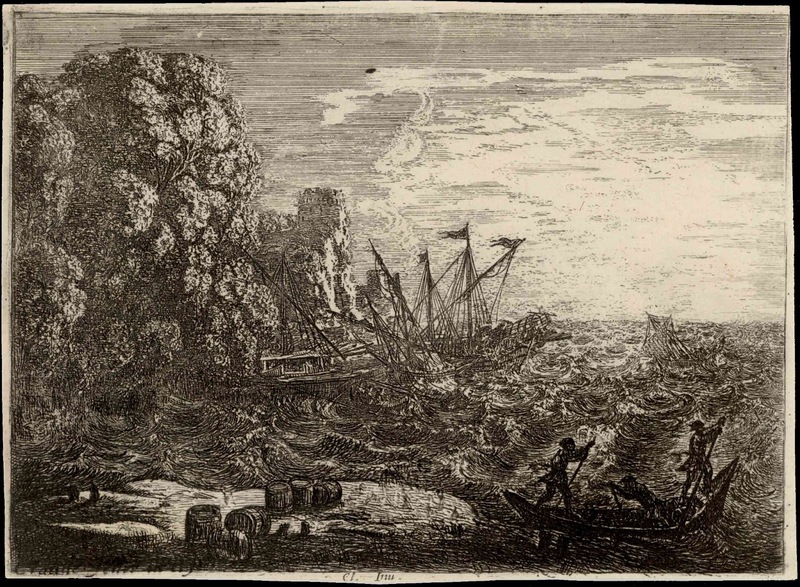 (shown below and discussed in the earlier post Holly & Clover) with Lorrain’s drawing, Print Study, and related etching, The Tempest [La Tempête] (shown further below). Condition: faint spotting on verso and a 0.5cm tear on left margin well away from the image otherwise in excellent condition with no blemishes. I am selling this print for $95 AUD including postage and handling to anywhere in the world. Please contact me using the email link at the top of the page if you have any queries or click the “Buy Now” button below. No. 5. 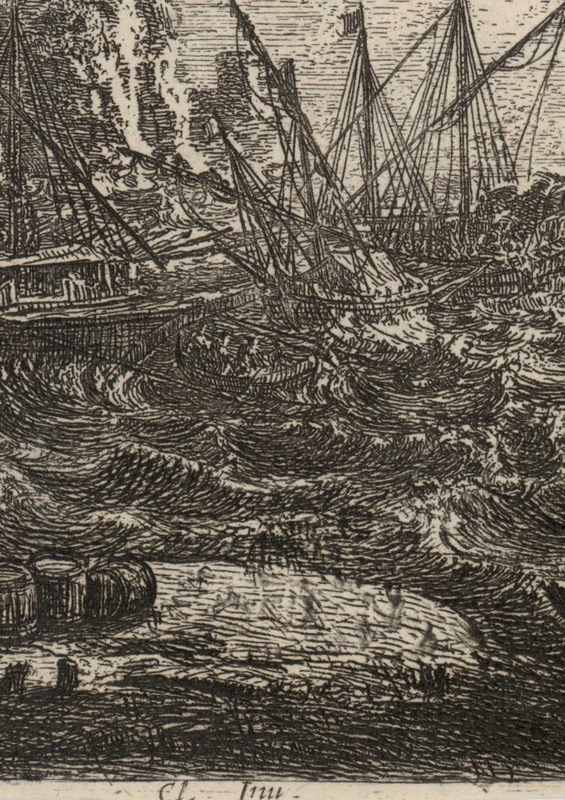 From the Original Drawing in the Collection of R.P. Knight Esq. Condition: well-inked impression in excellent condition with no foxing or blemishes. The print has been trimmed within the plate edge and attached at the corners to the same support sheet as issued by Schulze in 1816. I am selling this print for $220 AUD including postage and handling to anywhere in the world. Please contact me using the email link at the top of the page if you are interested or click the “Buy Now” button below. In the next post I will extend this discussion to address how artists following Lorrain’s Liber Veritatis evolved fresh ways of creating paper museums of their artistic practice.